The ongoing political crisis in Sri Lanka’s Tamil-majority Northern Province will lead to a realignment of Tamil political parties. Among other things, the present crisis shows that the existing political alignments are extremely weak and shaky and are as good as broken. Looking at the current trend, it is likely that the ruling Tamil National Alliance (TNA) will break into two groups by the time the next Northern Provincial Council (NPC) elections are held 15 months from now. The Ilankai Tamil Arasu Katchi (ITAK) led by veteran R. Sampanthan, the largest of the parties in the TNA, will go it alone, and is, in fact, determined to do so. The others in the TNA – such as the Eelam People’s Revolutionary Liberation Front (EPRLF) led by Suresh Premachandran, the People’s Liberation Organization of Tamil Eelam (PLOTE) led by D. Siddharthan, and the Tamil Eelam Liberation Organization (TELO) led by Selvam Adaikalanathan – may form an alliance. Fringe parties like the Tamil National People’s Front (TNPF) led by Gajendrakumar Ponnambalam are likely to join the anti-ITAK front. The leader or mascot of the anti-ITAK forces will be the Northern Province Chief Minister C.V. Wigneswaran. This is because Wigneswaran has been having a longstanding feud with the troika ruling the ITAK and the TNA, namely, R. Sampanthan, Mavai Senathirajah and M.A. Sumanthiran. In the feud, Wigneswaran has been having the support of all non-ITAK parties. In the NPC, the TNA is split in the middle, with 15 or 16 of the 30 TNA members supporting the ITAK’s No-Confidence Motion against the Chief Minister, and the rest opposing it. The NPC was elected (for the first time in history) in September 2013. 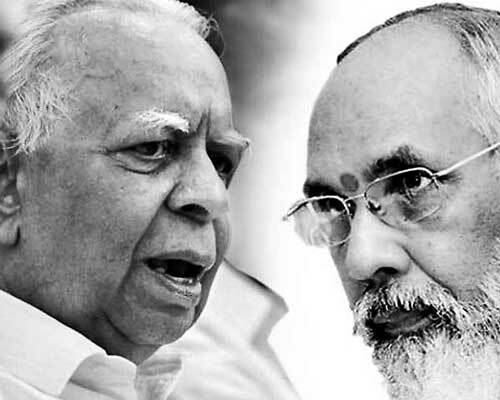 The TNA swept the polls winning 30 of the 38 seats and the non-political retired Supreme Court Judge, C.V. Wigneswaran, was made Chief Minister in view of his social stature and legal eminence. Initially, a common opposition to the then President Mahinda Rajapaksa, seen as a warmonger by the Tamils, ensured unity within the TNA. But once the common enemy was vanquished by Maithripala Sirisena in the January 2015 presidential election; differences arose within the TNA, especially between Chief Minister Wigneswaran and the TNA and ITAK stalwart Sampanthan. While Sampanthan and the rest of the ITAK/TNA top brass wanted to cooperate with the more liberal Sirisena-Ranil Wickremesinghe regime, Wigneswaran wanted to continue with the politics of confrontation. He exploited the lack of progress in constitutional reforms and new Government’s backtracking from other promises, to press for a hard line. When he was unable to get the TNA leaders to adopt the hard line, Wigneswaran became even more radical and confrontationist to the great embarrassment of the TNA’s leadership. In December 2015, he floated the Tamil People’s Council (TPC) as an alternative to the ITAK/TNA. The TPC attracted radical Tamil groups, university students and teachers, besides the media. Meanwhile, the non-ITAK parties in the TNA accused the ITAK of monopolising decision making. The ITAK argued that it has to have primacy because it is the single largest party, the oldest party and the only consistently democratic and non-militant outfit in the TNA. All the other parties have had a history of participating in the armed struggle for a separate Tamil Eelam. While, the other TNA constituents wanted the TNA to be registered as a political party, the ITAK rejected the demand saying that it would prefer to keep its distinct identity as it is its separate identity as “ITAK” which is fetching it votes. The radicalisation of the Chief Minister and the groups around him was helped by the manifest lack of progress in drafting a new constitution; in rendering justice to the victims of war; in the matter of returning lands seized by the military during the war; and in tracing disappeared persons. With the international community and the UN Human Rights Council (UNHRC) becoming soft on Colombo after the latter shed its hostility towards them post-Rajapaksa, Colombo became even tardier in fulfilling its promises to the Tamils made in the run up to the January 2015 Presidential election. To the disappointment of radical Tamils, the UNHRC recently gave Colombo two years to implement its pledges given in September 2015. There is also no sign that the UNHRC will press for the establishment of a Judicial Mechanism with international judges to go into allegations of war crimes against the Sri Lankan armed forces. Meanwhile, in 2016, a new issue arose, which helped the TNA to take on Wigneswaran. The issue was corruption and maladministration in the Northern Province under his charge. Sixteen NPC members petitioned the Chief Minister for action against all the four members of his Board of Ministers. Wigneswaran promptly appointed a three man commission of distinguished retired persons to investigate the charges. The commission found two of the Ministers, P. Ayngaranesan (Agriculture), and T. Kurukularaja (Education), guilty, and two others, P. Sathiyalingam (Health), and B. Deniswaran (Fisheries), not guilty. But this Wednesday, Wigneswaran announced that he is asking the two indicted ministers to resign and the other two to “take leave” as the inquiry against them is not complete. In his statement, Wigneswaran also clearly indicated that the whole issue of corruption and maladministration was raised to tarnish the image of his government and charged that it was a move of some person to oust him from the Chief Minister’s post. This insinuation and his ruling on the discharged ministers infuriated the ITAK which promptly went to Governor Reginald Cooray with a petition to move a No Trust vote against the Chief Minister. The ITAK claims the support of 21 of the 38 NPC members. And the non-ITAK parties are claiming the support of 15. The latter have also resolved to take the fight to the streets. Governor Cooray has asked the Chief Minister to prove his majority in the NPC within seven days. Meanwhile, some neutral parties led by PLOTE leader Siddharthan wanted to defuse the crisis through a compromise formula. TNA leader Sampanthan agreed to the formula, according to which the Chief Minister will not ask the two discharged ministers to go on leave pending a fresh inquiry, and in return, the ITAK will withdraw the No Trust motion. But the Chief Minister, buoyed by expressions of support from Tamil civil society and university students, rejected the compromise proposal and dared the ITAK to go ahead with its No Trust motion. Wigneswaran feels that if he is thrown out, he will emerge as “the” leader of the Tamils and a doughty fighter against corruption, and sweep the next provincial elections.